Three graduates of Hobart and William Smith Colleges met up for a night out in New York City recently. Yaoxin Liu was a Mathematics major. Marcela Melara and Shaun Viguerie majored in Computer Science. All three of them completed Honors projects during their senior year in the Department. 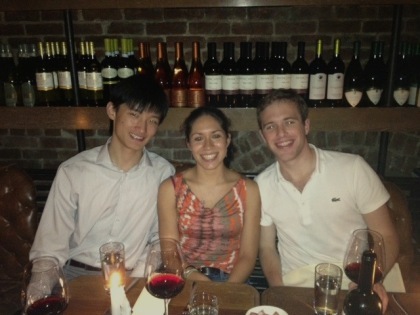 Yaoxin and Shaun are working in New York City, while Marcela is attending graduate school at Princeton University. Max Beckett '11 writes as he nears the halfway point in a Master's degree program in computer science at Northeastern University. Max, who was a double major in mathematics and computer science, is working with a research group known as the ReConfigurable Lab (RCL). He has been spending his time there working on GPGPU (General-Purpose computing on Graphics Processing Units), an attempt to harness the immense computing power of modern graphics cards for other purposes than graphics. Max first started work on this field for an independent study at HWS. This summer, Max will have a internship with Mathworks, the company that makes MatLab, doing more work with GPUs for their Parallel Computing Toolbox. "This past January, Resource Interactive was named the fourth best digital agency in the country by AdAge magazine, a leading magazine in the digital agency industry. The day after we found out about our award from AdAge we were greeted at work with waffles and champagne in one of the three kitchens in the Columbus office. I either learn or experience something new every day at RI. "Also outside of work, about four months ago I created Fluid Ideation LLC through which I do freelance web development. I have worked with two clients through Fluid Ideation, and I have meetings this week with two new clients. Let me know if you need a website!" Keenan Simons (Hobart '09) will be starting graduate school at the University of Central Florida in the Fall. He will pursue a Masters Degree there, with a focus on computer vision and computer graphics. Keenan was a double major in Mathematics and Computer Science at Hobart, and he received the department's John Klein Prize for excellence in Computer Science in 2009. Joshua Davis (Hobart '10) has completed a Master of Engineering in Computer Science from Cornell University. Josh was a double major in mathematics and computer science at Hobart and William Smith Colleges. 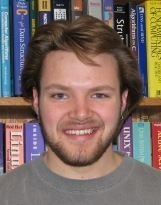 While at Hobart, he did an Honors project under the supervision of Professor David Eck, and he was awarded the John Klein Prize for excellence in computer science. Alex Bryce will be defending his master's thesis at RIT on April 15th. When analyzing a discrete reaction-diffusion dynamical system, one primary area of interest is locating where in the parameter space Turing instabilities occur. In his thesis Alex shows that Turing instabilities cannot occur in the react then diffuse equations if all diffusion coefficients are equal. The Replicator dynamic is a system of equations that is used in evolutionary game theory applications to study behavior types in animal populations. He also discusses conditions for a Turing instability in first order discrete replicator systems and illustrates this with computer simulations of the results. After finishing his master's degree, Alex will be starting a job at Mathematica Policy Research, Inc. as a Research Assistant/Programmer on July 5th in Washington, D.C. He will be working on a variety of statistical research projects (depending on who the company contracts with). The DC branch works more with projects relating to health care and education policy. Some of his duties will involve programming in SAS, data collection and analysis, literacy review, and writing reports. David Sugar '02, who majored in Computer Science at Hobart College, is working at The Boys Latin School of Maryland (www.boyslatinmd.com), a college preparatory school. He reports that he has started graduate school at UMUC (University of Maryland University College), working towards an MS degree in Information Technology. Lisa Maticic '10 will leave on February 8 to start a tour with the Peace Corps in Uganda. She will be blogging about her experiences from time to time, and you can follow her story at lisamaticic.blogspot.com/. Lisa majored in mathematics here at William Smith College.